Early life influences adult diseases. Such serious public health priorities as diabetes, heart disease, breast and prostate cancer, osteoporosis, and depression have all been related by recent medical studies to the development of the fetus. Environmental influences, such as maternal diseases, can cause irreversible metabolic consequences for the fetus, altering susceptibility to later adverse outcomes. This effect is known as biological programming. Among its well-documented causes are such maternal diseases as diabetes and preeclampsia, and maternal exposure to smoking. Deviation from a normal development of a fetus can also be mark a genetic predisposition to adult health risks. 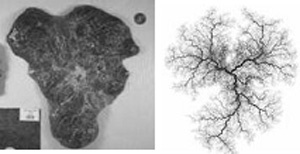 Left to Right: typical placenta; X-ray of the placental vasculature; model placental vascular tree. If we can understand the processes by which the fetus is altered and develops risks for lifelong disease, we may be better able to protect the child and the adult. We may also be able to devise obstetric surveillance and interventions to protect the fetus from key intrauterine stresses. Fortunately, every baby is born with a “crystal ball” for determining the problems of its fetal development — the placenta. Before birth, the placenta is our sole source of oxygen and nutrients. It is a principal regulator of fetal growth and health, faithfully recording any developmental problems. After birth it can be immediately assessed, without any interference with the newborn. The study of placenta during “Random Shapes” program was championed by Dr. Carolyn M. Salafia, the head of Placental Analytics of Larchmont, New York, and an international expert in placental pathology. The surface of a placenta is a quintessential random shape: typically round, it is nevertheless highly variable. The variation of the surface shape is a record of adverse impacts on the development of the baby. Decrypting this record poses an exciting challenge. During Random Shapes, Dr. Salafia met Michael Yampolsky, an expert in Dynamical Systems from the University of Toronto. One of the striking aspects of irregular placental shapes is how symmetric they often appear. This symmetry was a clue which suggested to Salafia and Yampolsky that the variation in shape may be caused by a deviation in the branching structure of the underlying vascular tree. Deformed placental shape (left) and the model (right). To test this hypothesis, the researchers developed a dynamical model for the placental angiogenesis – the process of vascular growth. It is based on Diffusion Limited Aggregation (DLA), an important model of random fractal growth in Mathematical Physics. The DLA-based model of Salafia and Yampolsky simplifies the picture of the vascular growth, and does not fully incorporate the biochemical mechanisms driving the growth. Nevertheless, the model has successfully predicted much of the observed variability of placental shapes. The pathological shapes correspond to maternal stresses which suppress vascular growth at different moments in gestation. This is an important finding, since stresses have different effects at different times. Salafia and Yampolsky also studied the relation of placental mass to fetal metabolism, and a resulting scaling relation between fetal mass and placental mass. As predicted by the model, a pathological placental shape is associated with a reduced metabolic efficiency, which results in a lower fetal birth weight. These findings are published in a recent article in Placenta, [Placenta, 29 (2008), 790–797] and several other papers are currently under review.